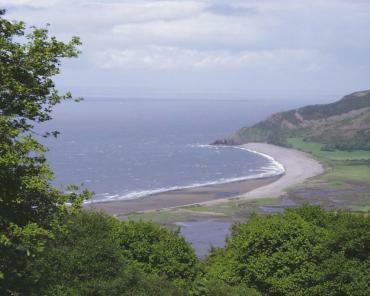 BeenThere-DoneThat: The area around Porlock, Somerset. 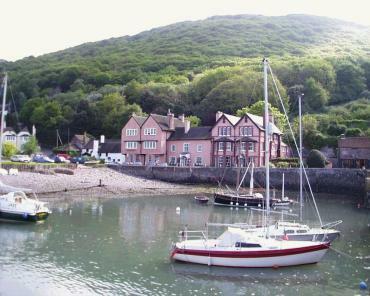 Porlock Weir, at the west end of Porlock Bay, showing the Anchor Hotel (the obvious pink building). 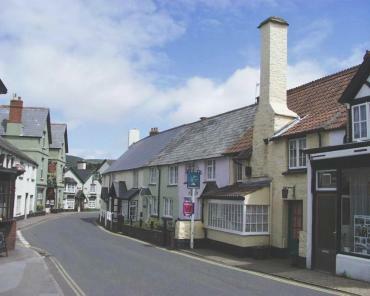 The small white building to the left is the Ship Inn (under the same management) which is a 16th century coaching inn. This is a very small community but rather picturesque. The road from Porlock is narrow enough in places that it would be impossible for two vehicles to pass but it is only 1.5 miles and the road ends at Porlock Weir passing through the small hamlet of West Porlock on the way. There is a large car park and also a bus service that connects with Porlock and, subsequently, Minehead. The main A39 (don't laugh) through Porlock village. This is an attractive village with its colour-washed houses arranged along the narrow winding main street. This photograph was taken during the week at around lunchtime in May. It isn't always this quiet and some of the larger vehicles sometimes have problems if they meet on the bends in the narrow street. Porlock Bay from the 'new' toll road (Porlock to Pittcombe Head). This road enables vehicles, such as cars towing caravans, to avoid the notorious Porlock Hill, with a gradient of 1 in 4, on the main A39 to Lynton and Lynmouth which are just over the Devonshire border. Bluebells (Hyacinthoides non-scriptus) by the footpath from Porlock Weir to Porlock. 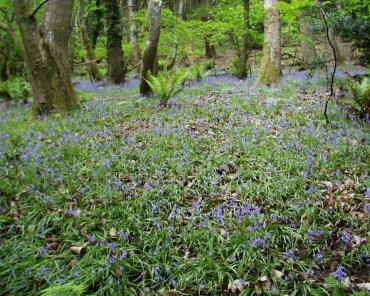 Bluebells are a mainly woodland plant but prefer only partial shade and often appear in large numbers if part of a wood is cleared. They can also be found in hedges and on banks and verges and flower between April and June but are most abundant during May. Culbone church, which is all of 35 feet long, is reputed to be the smallest church in England still holding regular services and the main structure dates back to the 12th century. 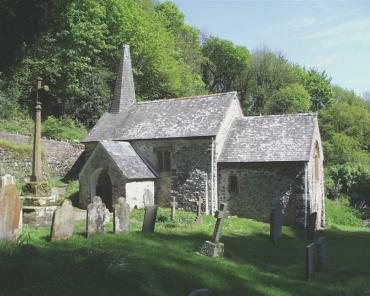 It is accessible only on foot and can be reached by a two mile walk from Porlock Weir. The footpath starts immediately behind the Anchor Hotel and initially passes through some open fields but is mostly through woodland. There is a nice view of Porlock Bay on the way (see More pictures of Porlock Bay). The path runs along the Porlock to Worthy road for a very short stretch and although there are some steep uphill sections, with steps, it is generally an easy walk. 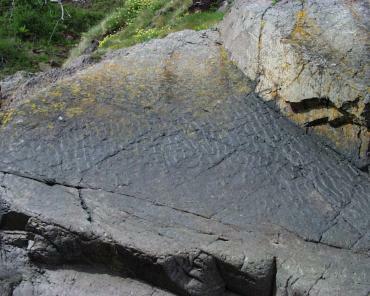 Fossil ripple marks in Devonian sediments, about 400 million years old, in the cliff west of Porlock Weir. We saw this slab after walking about a half mile west of Porlock Weir along the shore. On the way we passed a small cave which appeared to be man-made; purpose unknown.